When they need to free iOS storage. When they need to manage iOS storage. When they want to sell, repair or donate their old iPhones. When there are data security issues on the device where the iPhone backup is stored. If iPhone backup couldn’t be completed or restored. It is evident that there are several reasons why you may need to delete iPhone backups. But the limitation we face is that many of us do not know how to delete iPhone backup or even manage iPhone storage. 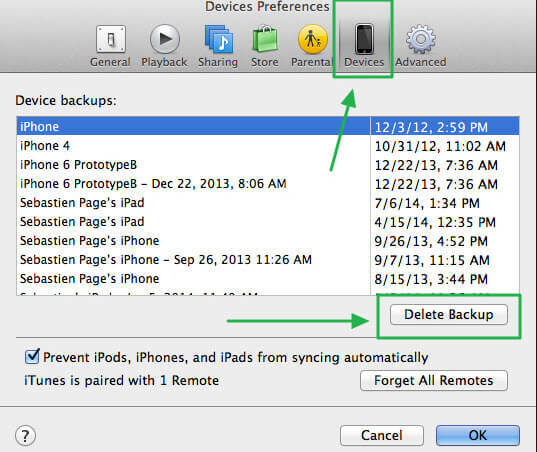 Part 2: How to Delete iPhone Backups from iCloud. Part 3: How to Permanently Erase iPhone Data before Selling It, Repairing It, or Giving It Out. iTunes Backup is important in keeping a secured version of your iPhone data on a single computer. But there are times when multiple versions of your iPhone data will be stored on your Mac or PC by iTunes. Deleting multiple iTunes backup can help to conserve valuable storage space. To delete iTunes backups, you will have to first locate where iTunes stored your iOS backups on your PC. Find Backups on your Mac: From the “Menu” bar, click on the “Search” icon, then enter ~/Library/ApplicationSupport/MobileSync/Backup/. However, If you choose to locate a specific backup on your Mac OS, you can follow the path: iTunes > Menu > Preferences > Devices > Contro-click the backup > Show in Finder. Find Backups on your Windows PC: Go to \Users\(username)\AppData\Roaming\Apple Computer\MobileSync\Backup\. Another way of locating your iTunes backup on your PC is through this path: Enter %appdata% in the Windows’ Search bar > Enter > double click on these folders: Apple Computer > MobileSync > Backup. Step 1: For Mac: click on iTunes > Preference. For Windows: Click on Edit > Preference. Step 2: Go to Device. Step 3: Select the backup that you want to delete. If there are multiple backups, you can move your mouse over then to view more details. Step 4: click on Delete Backups, and confirm. Many iCloud users go looking for a list of their iCloud backups in iCloud when they want to delete their iCloud backup files. You should know that you won’t find a list of your backup on iCloud. 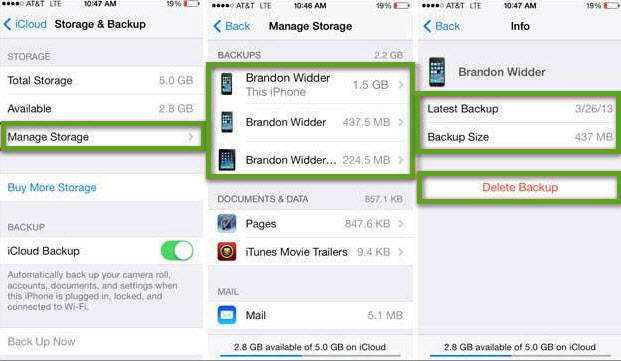 Here is how to find a list of your iCloud backup on iPhone, PC or Mac. On iPhone: if you’re using iOS 10.3 or later, go to Settings > Your Name > iCloud > iCloud Storage > Manage Storage. On Mac: Go to Apple menu > System Preferences > iCloud. On Windows: Go to iCloud for Windows > Storage. Step 1: Click on Settings > Your Name > iCloud > iCloud Storage > Manage Storage. Step 2: Choose a backup you will like to delete. Step 3: Delete the backup. Why should We Permanently Erase iOS Data? When you have to sell your old iPhone in order to get a new version. When returning your employer’s iPhone. When you feel like starting afresh. You want to erase some data to improve performance. When you are trying to hide a file permanently. Confidentiality and privacy are the prime purposes why many iOS users seek for a tool that can aid them in erasing iOS data permanently. iMyFone Umate Pro – The Ultimate iPhone Data Eraser. iMyFone Umate Pro or iMyFone Umate Pro for Mac is the most advanced data erasing tool for iOS devices. It is designed to erase any form of iOS data, and backup important iOS data. It is mostly recognized for permanently erasing iPhone’s current and previously deleted files, and rendering them 100% unrecoverable. iMyFone is trusted by thousands of users (every year) and reported by well-known media around the world. Step 1: Download and install Umate Pro on your Mac or PC. Connect your iPhone to your Mac or PC using USB cable. Step 2: Choose “Erase Private Files” as your erase mode. This is the third option on the left-hand bars. Note, if want to erase all your backups, please choose the “Erase All Data” tab. Step 3: Click on “Scan” to view your iPhone files that are legible to be deleted with respect to the erasing mode you chose. Step 4: Click on “Erase Now” to remove the selected files from your device. 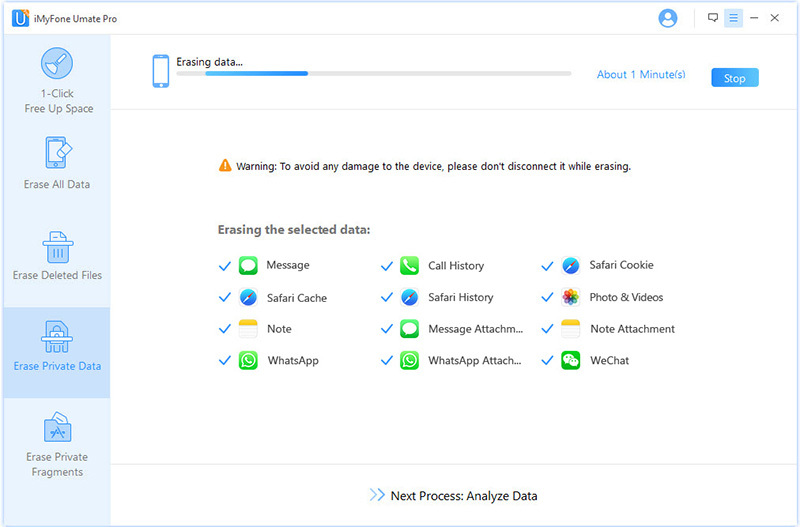 What can Umate Pro Do for you in erasing iPhone Data? Completely erase iPhone; 100% unrecoverable: With Umate Pro, you can permanently erase current and previously deleted files with no chances of recovery. 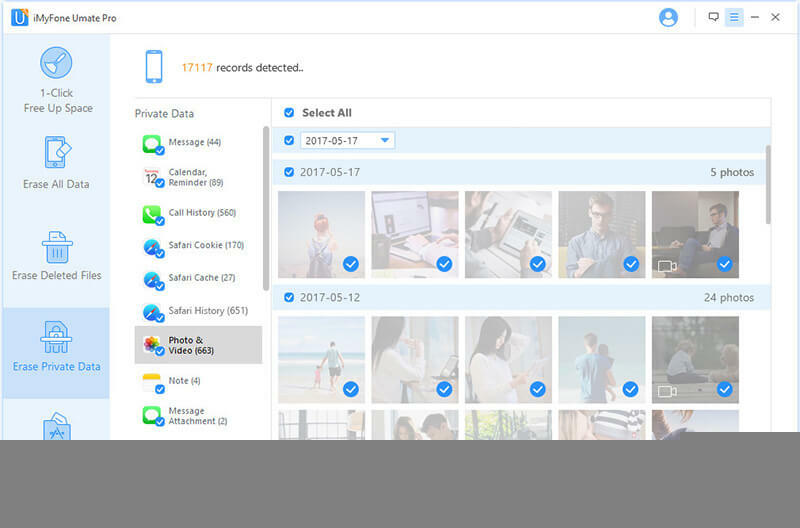 Erase all kinds of iOS data: iMyFone Umate Pro can delete every type of iOS data, be it messages, call history, contacts, photos, videos, etc. Erase deleted iOS files: iOS usually leaves traces of iPhone data on iPhone after deleting files. This can lead to recovering such files using a recovery tool. But with Umate Pro, all deleted files can be permanently deleted leaving no trace of the file behind. Erase even third party apps: Third party apps such as WhatsApp, WeChat, Kik, Viber, Instagram, Messenger, etc. can also be erased from iPhone with Umate Pro. 1-click to clear up iPhone: With one-click, Umate Pro can clear up every file on your iPhone to save huge iPhone storage for you and improve iPhone performance.